Each year I revamp how I’m setting and tracking my goals, and each year the system gets a little better. 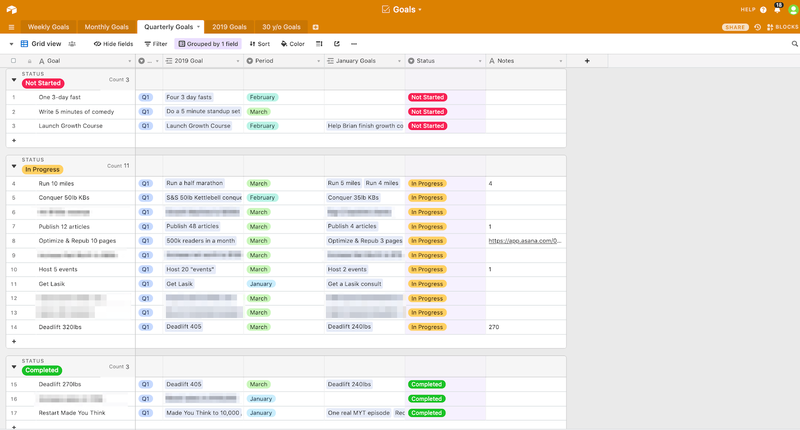 Last year, I was using some combination of Asana for the first half of the year, and then added in a Google Sheet as outlined in my productivity article. Even with the Google Sheet, the system seemed a little haphazard. It wasn’t easy to track the relationships between my Annual, Monthly, and Weekly goals. And the arbitrary 3 goals per day felt forced at times. What I’ve been wanting is a way to track my Daily, Weekly, Monthly, Quarterly and Annual goals in one place, with good visibility on what each daily goal is supporting at the macro level. After some finagling with different apps, I think I’ve finally built a good solution in Airtable. Easily track your Yearly, Quarterly, Monthly, Weekly, and Daily goals. Move between the different levels of your goals quickly to see how they fit together. Reflect on how each period is going. But most important, it makes it stupid-simple to plan out short term actions that will best impact your long term goals. It lets you take big, harder to target goals and break them down into the simple steps you can take each day to make it more likely you’ll achieve them. And it does it all with pretty colors, which is always a plus. If you want to implement this yourself, I have an Airtable template you can make a copy of to make things easier. I break these out by a few categories: Personal, Physical, Financial, Influence, and Business. Personal Goals are ones related to, well, anything personal and social. This is kind of a catch-all for things that’ll make my life better. Physical Goals are anything related to improving my health. Financial Goals are specifically related to money and investing. Influence Goals are for this site, Made You Think, and the Medley. Business Goals are for Growth Machine, Cup & Leaf, The Writer Finder, and any other business-y projects I have going on. Adding categories for the goals at this level is mostly useful for making sure I’m not neglecting any area. It’s easy for me to come up with physical goals, for example, but I’m not always great at coming up with Personal goals. Deadline is the Quarter I want to accomplish the goal by the end of. Status is a way to track if I’ve started or completed the goal. Baseline is where I was at the start of the year. Project Link is where I can put a link to a related Asana project, as relevant. And finally, there’s a “check in” column for each month of the year where I can log what progress I made on it. This gives a useful birds-eye view of how the year is going as it progresses, and makes it easy to reflect at the end of the year. I think the Quarterly goals are the least important of the different levels, since you can capture it within your monthly goals fairly well. If I were going to get rid of one of the sheets this would probably be it, but I like being able to see how everything is going on a 3-month timescale so I don’t always have to go through backing my weekly and monthly goals into the yearly goals. Monthly goals get the same structure as the Quarterly goals. I take the Quarterly goals, set Monthly goals based on making the best progress I can towards them, and then track them based on their completion status. In the “Notes” column, I’ll track either how close I am to hitting that goal (like having done 1 of the 4 articles for the month), or link to a related Asana project where I have a more detailed task list. You’ll notice this is set up differently from the Monthly and Quarterly goals. I have it grouped by the Day each goal is due, and then have it set to hide any goal once I check it off in the Checkbox column. Each goal also has a week number assigned to it (4, in this example), which lets me keep track of what all my goals were each week in the past, in case I want to go back and look at how progress has been going. Last, to be clear this isn’t a task list. These are more the “most important things” where if I get them done on that day, it’ll be a productive day and I’ll make meaningful progress towards my goals for the week. Things I’m going to do anyway don’t go in here, nor do the myriad of mostly Growth Machine related things I need to do that are in Asana. Goal tracking, to me, is most importantly about doing the things that won’t get done on their own. All of these goals would be easy to ignore in favor of the seemingly urgent other work, which is why this kind of goal tracking is so useful. So each day, I’ll take the goals in Airtable I have for the day, add them to Asana, and get to work. 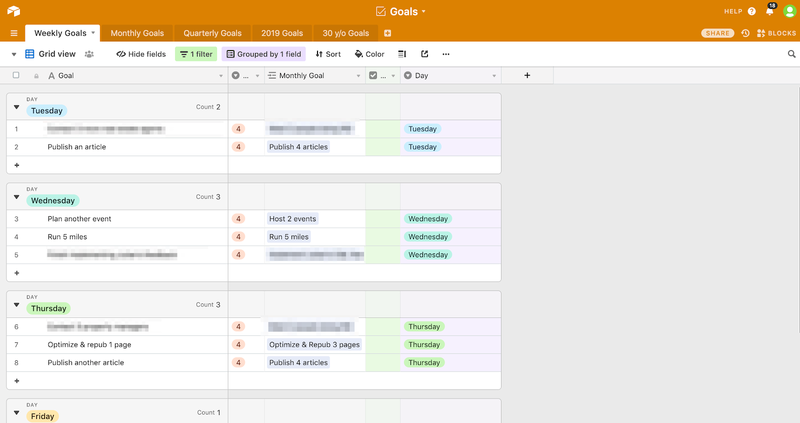 One mistake I see people make with this kind of goal tracking is trying to set goals too far in advance, like planning out the goals for January, February, and March at the start of the quarter. I intentionally don’t do this because I think you’re much more likely to overperform, underperform, or deviate from your goals in some unexpected way than makes planning too far in advance kind of pointless. Instead, I don’t plan the next periods goals until the end of the previous period. So on Friday, I’ll take some time to clean up my goals from that week and plan the goals for next week. At the end of the month, I set the goals for next month. At the end of the quarter, I set goals for the next quarter. As I’m doing that, I might find that some goals no longer make sense, or need to be adjusted, at higher levels in the system. That’s totally fine, and I think an important part of the process. You don’t want to let yourself off easy from tough goals, but you also don’t want to force yourself to keep pursuing something or some direction that no longer make sense. This is meant to be a flexible, adaptable system to however you like to set and track your goals. One thing you might add is a longer term view, like five or ten year goals. Taylor Pearson uses a similar system, where he goes all the way up to 25 year goals. You could add Life Goals, you could add a Habit tracker, you could go down to Hourly level tracking… go crazy. 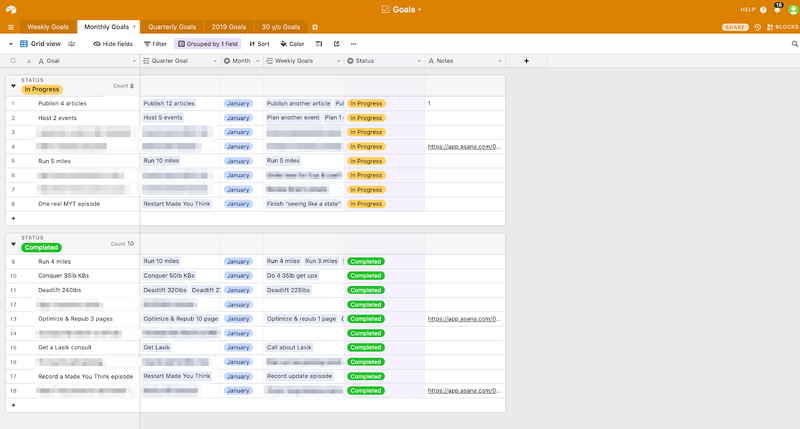 Airtable is pretty flexible for this kind of structured data, and I’ve been enjoying using it for this and my personal CRM. Have fun with it, and let me know what modifications you come up with on Twitter.